SECURITEX CAR. BUS. TRUCK washing counter system. The SECURITEX car wash counter system is designed and custom manufactured by Securitex Electronic Systems Engineering. This system is use to track the number of cars passing through the hand wash car wash station. This is to ensure that the car wash operator has and idea of the number of car being wash a day and collection tally accordingly. 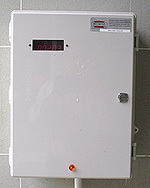 The above “Model SCWC-1C DESIGN AND BUILT IN 2006” system is made up of 1 unit digital counter that can count up to 99999. The high-efficiency red 5-digits 7 segments LED display used is highly visible even in bright sunlight area. The intelligent function built-in allow the counter to detect tailgating and reversing vehicle into the washing bay thus prevent double counting. Furthermore in situation where the power supply system malfunction, the counter is able to retained the last count before the power outage. This ensure the last count is not lost until counter is manually reset. The above version have a power back-up units that can even continuously provide power to the counter and the Nortech Vehicle Loop detector to allow counting to continue even after the power outage. To further enhance the accuracy of the SCWC-1C counter, we have put in a dual sensors technology on the counter. The sensor works in pairs thus for the counter to start counting the vehicle entering the car wash zone have to compromised 2 sensors (A and B loop) simultaneously before the counter can move 1 digit. This will ensure that small object is not count like motorbike, bicycle and even the machine used in the car wash area. Car wash counter with 3G optional. The Securitex carwash Counter system with built in 3G option can sent the number of car wash or count to the carwash operator to remotely check the number of vehicle wash without going to the washing bay. Car was counter system with integration to CCTV optional. The Securitex carwash Counter system can also be integrated to the site CCTV system or Securitex car wash CCTV system and allows the operator to Remote View In (RVI) to see the washing business and also to check on the car wash bay activity. In the event there are dispute or incidence, the operator can also retrieve the video for analytic purpose. 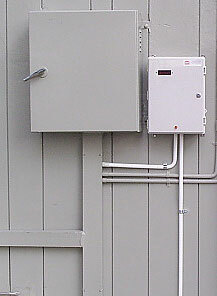 •Terminal block permits quick 12 volt power connection.